and I have been itching to try to do some kind of canvas, this is actually canvas board, with acrylics and other stuff I have laying around. I had fun doing this board. Oh my goodness. Could this piece be any more gorgeous?....I think not. It is quite obvious that you were inspired by this theme. Bravo, my dear friend!! I've asked Diane to unspam you so that others will have the opportunity to see this piece!! This is a lovely piece! Great background and play on the theme. beautiful mary Beth!! 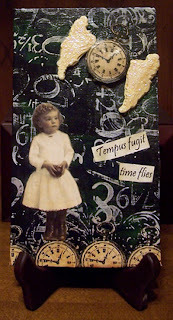 love the winged clock and the image is so cute!! love it! Great first entry! Such a fun place to play, glad you decided to join in all the fun! Karen here, the comment deleted was for another blog I was getting a link for and brought the window back up realizing it was the wrong window....so the comment would have made no sense what-so-ever! My apologies!!!! Beautiful piece!! Love your numbers and clock theme! Beautiful 1st entry, the whole composition works so well. this is just precious! Adorable image and composition! This is so gorgeous! Beautiful background. This is a beautiful card Mary-Beth, and I love your shadow box.